If I had a baby I would totally want to use this. Since I dont have kids, I will recommend it to my family & friends instead! Four position options. Front carrying in or outward facing. Back carrying in or outward facing. Ergonomic design with back distribution and a waist belt for added parental and babe comfort. All fabrics safety tested and free from hazardous chemicals. Click Here to read So Sew Mamas Full review. 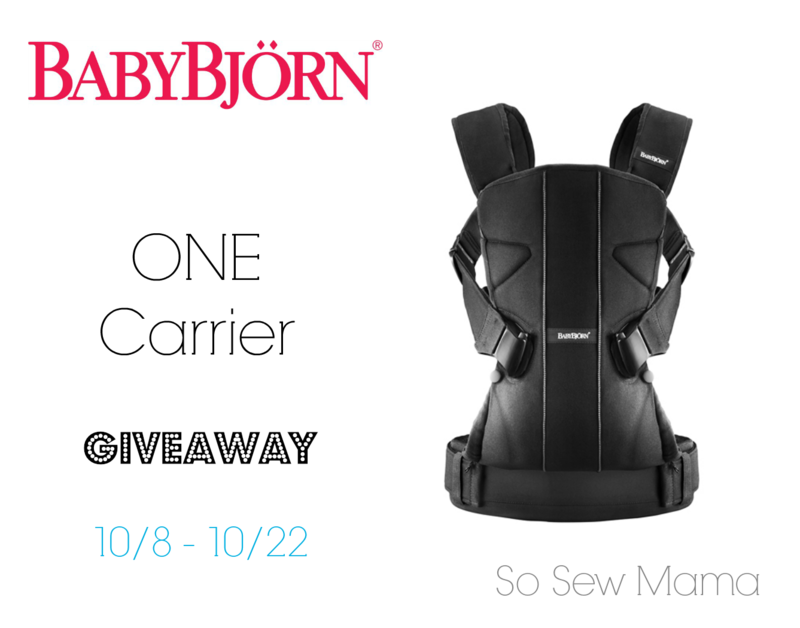 One reader will receive the BabyBjörn ONE carrier. The winner must be 18+ years of age and have a US address. Please allow 6-8 weeks for delivery. Winner must reply to email to confirm address with 48 hours or a new winner is chosen. The more entries you complete the greater of a chance you have at winning. So Sew Mama and the bloggers involved are not responsible for sponsor prize shipment and fulfillment. Facebook is not affiliated with this giveaway. I was not compensated for this post.